Combine the tour with a unique dining experience in one of the most visited bars in Bratislava. Enjoy Mediterranean cuisine and internationally awarded Thai cuisine and a wide selection of cocktails and wines with unforgettable panoramic view of the city. 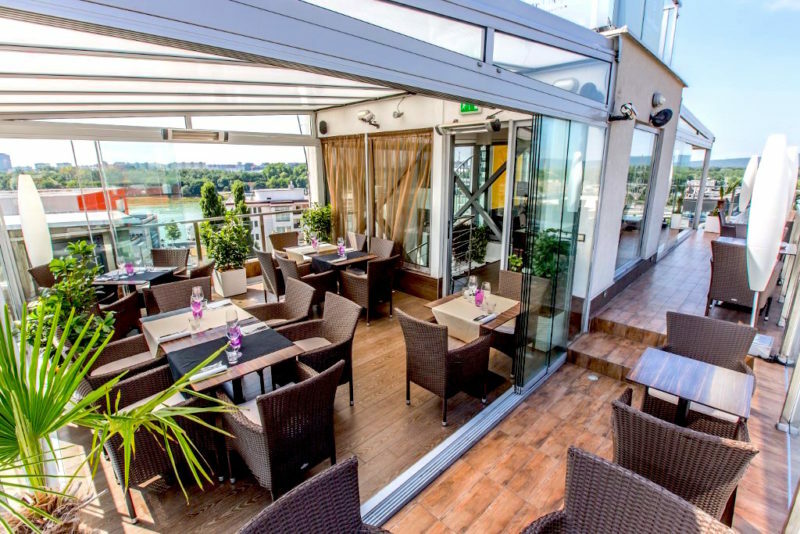 The light Mediterranean cuisine is available directly in the restaurant on the roof of one of the Old Town houses in Bratislava. In summer you can use an open terrace and soak the atmosphere of the town lying below you and enjoy prosciutto, souvlaki or carpaccio. With a little imagination it will bring you back into the coastal atmosphere and put all troubles out of your head. The great food needs a great ending and that is unique desserts and delicious coffee. In addition to the view of the whole Bratislava, the bar offers 70 kinds of exclusive vodkas. It is aimed just at this kind of alcohol. Vodkas from Russia, Poland, Netherlands, United States, Germany, Ed Hardy vodka, Slovak Double Cross vodka, and vodka with a scorpion, Wokasaki, which originates from Japan and into which saké is stirred, and vodkas filtered through diamonds. If you lose a little in the menu, the staff will advise you. Tasting is prepared for the people who do not know a lot about vodka. A guest can order selection of some vodka. He will be offered by 1.5 centilitre portions of five kinds of vodka to be able to compare them and choose the one which he will taste the most. In addition to vodkas, in the Sky Bar you will also enjoy a wide range of cocktails. You can prepare yourself two of them – Cosmopolitan and Gimlet. When ordering these cocktails, a waiter will bring your an empty cup and a small shaker containing all ingredients.